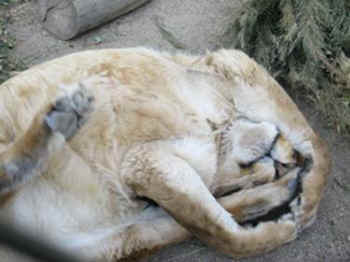 Sheba lived at PAWS' Galt sanctuary for 15 years, where she was finally able to be herself and express normal lion behavior. Once at PAWS, Sheba received a healthy and complete diet and much needed veterinary care. During a routine physical examination it was discovered that Sheba had been declawed on all four paws sometime in the past. Declawing big cats often leaves these majestic animals crippled or in pain for the rest of their lives. It is with heavy hearts that we report the passing of Sheba, an African lion. Born in a breeding facility in 1993, she and her brother were sold as "pets" to a man who kept them in his private home in Detroit. When the male lion became too difficult for their owner to handle he was euthanized. Being an inherently dangerous wild animal, Sheba also became increasingly difficult to handle and her owner surrendered her to the Michigan Humane Society. When the Humane Society contacted PAWS cofounders Pat Derby and Ed Stewart, we quickly agreed to provide her with a forever home. Sheba lived at PAWS' Galt sanctuary for 15 years, where she was finally able to be herself and express normal lion behavior. Once at PAWS, Sheba received a healthy and complete diet and much needed veterinary care. During a routine physical examination it was discovered that Sheba had been declawed on all four paws sometime in the past. Declawing big cats often leaves these majestic animals crippled or in pain for the rest of their lives. Sheba's paws were definitely affected by this surgery, causing her to walk on the tips of her toes. Fortunately, she always had access to soft soil and grass to walk on, and this helped reduce the pressure on her damaged paws. 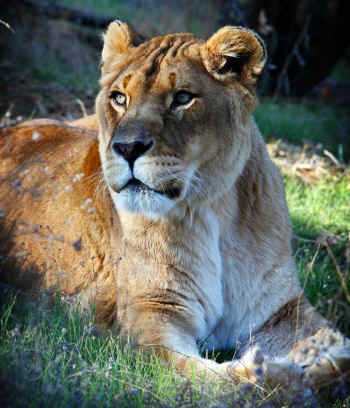 Sheba was later moved to a much larger habitat at PAWS' ARK 2000 sanctuary, where she lived next door to lioness Camba and the other rescued Bolivian circus lions. Watching Sheba's first steps into her spacious new habitat was an emotional experience for Pat and Ed, as they had always dreamed of a large habitat and companions for this special lion. Sheba was fond of Pat and Ed, but was not especially enamored of anyone else. At PAWS, animals are completely free to express their wild natures, and they are not required or expected to interact with people. Big cat supervisor Renae Smith recalled meeting Sheba over eight years ago in Galt when she was a new keeper. Sheba would sometimes roll over on her back and make a low "cooing" sound. Sheba seemed calm when Renae would rake leaves outside her habitat fence, and would sometimes even roll over on her back and make a low, "cooing" sound. Sheba maintained this trusting demeanor after her move to ARK 2000, which made it very easy for Renae to administer the medications Sheba needed. Sheba's mobility gradually decreased over the past two years, but she still enjoyed exploring her grassy habitat. Her favorite spot was resting under a large oak tree where she could look out over the other lion habitats, and where she could watch birds, squirrels, and turkeys pass by. Ed built a dirt pathway and ramp which made it easier for her to walk up and down the hill from her den to her tree. She received a variety of arthritis medications daily, hidden in pieces of her favorite treats. In late April, Sheba's condition began to decline. Her appetite began to wane, and she was having greater difficulty walking. Medications were adjusted, but ultimately nothing could stop the progression of her symptoms. On May 4th, the difficult but compassionate decision was made to euthanize her. Sheba passed from this life at age 23 - a long life for a lion - surrounded by those who loved her. A necropsy performed by veterinary pathologists at U.C. Davis revealed that in addition to arthritis, Sheba also had cancer in her kidney, adrenal gland, and lungs. This magnificent lioness will be truly missed by all who were fortunate enough to meet and care for her.